Nick is the founder and CEO of Delmondo and Content Marketing Manager at Percolate. He works with brands and startups improving their digital marketing and social media strategy, focusing on branded content. He put the first Instagram Video on TV for Oprah and is a frequent speaker and writer. This week Snapchat announced its newest feature – and one of the biggest updates to its platform yet – with the launch of Discover. It’s getting a ton of press because Snapchat is one of the most exciting platforms today. Publishers, marketers and consumers are interested because there is a huge potential to make tons of money and deliver high volumes of content on it, especially against the likes of media partnerships with social networks like Facebook and Twitter. That being said, it’s a big gamble in the long run for not just the company, but for the brands and publishers behind that content as well. Snapchat today builds a premium content delivery feature unlike what has been done on Facebook and Twitter, convincing publishers to work together instead of constrained by the product company. They control the flow of premium content, and can take a cut of the monetization along the way. Imagine if Facebook and Twitter had on-boarded brands and media publishers in the same way instead of opening up the flood gates of branded accounts? This is the brilliance of Snapchat’s team. For brands, it’s the Wild West. BMW, Ritz, Sperry and others have all signed on as launch partners, but for the most part their ads are static (minus the same video content repurposed). There’s no learn more, no click-through and no way to share or connect with a brand. Good content is R.A.R.E – Relevant, Actionable, Responsive and Entertaining. Snapchat Discover is missing a huge gap of audience interaction and engagement that is crucial for real relationships to form. 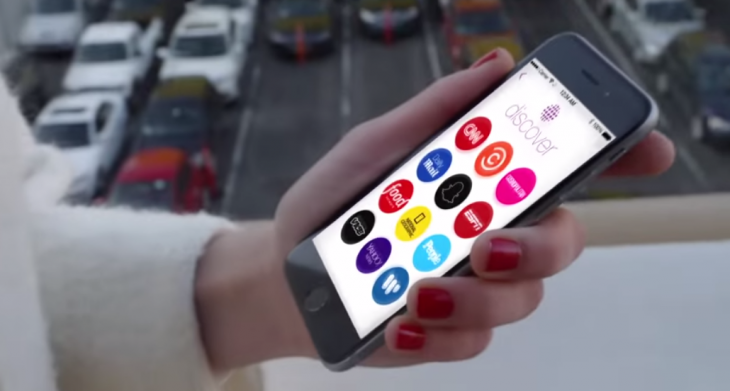 In essence, Day 1 of Snapchat Discover is no different than a digital magazine stuck inside of Snapchat. For publishers today, this is awesome. They now have a head start on building an own audience on Snapchat to get ahead (or on the level) of where today’s top Snapchat influencers are. They can monetize a new platform that they didn’t have to build, and get to test out some new storytelling methods. But just like on a publisher’s website, Snapchat’s discover feature will soon have to evolve or become saturated, just like most of these publisher brands mobile sites already are. This is what’s at the core of the “native ads” debacle that’s confusing 3/4ths of the advertising world. It’s simple – publishers will only be able to provide so much branded content on their official channels before their audience gets turned off, views and engagements drop, and the value for advertisers becomes null. No matter how much content you create as a publisher, you have ethical responsibilities that can’t be overlooked no matter what new platform opens up. 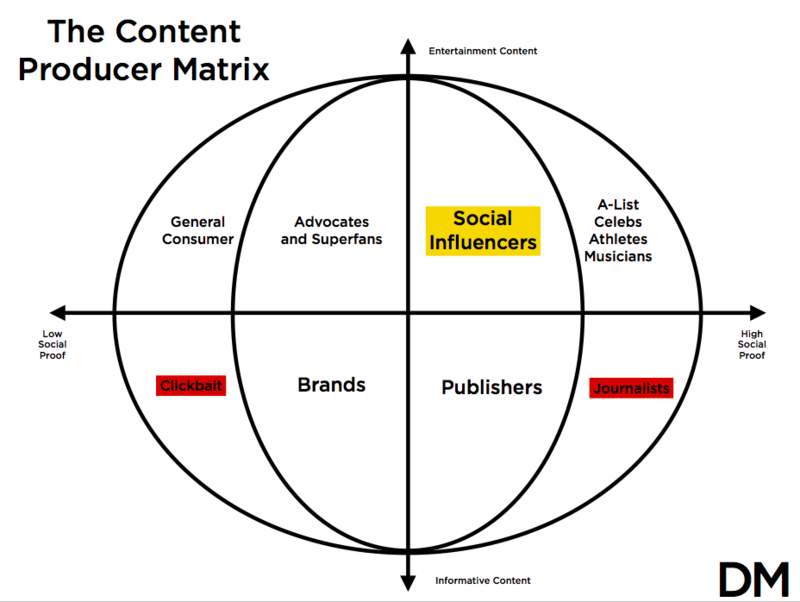 This is illustrated in our Content Producer’s Matrix below. This is why the influencer marketplace is so ripe for co-created content. Social influencers provide the greatest area of co-created content without interference or loss of authenticity and Snapchat is becoming the perfect platform for many brands to take advantage of the millions of views on influencer content daily. I’ve been having conversations with hundreds of influential Snapchatters before and after the launch, and they feel the same way about Discover as they did the McDonald’s Sponsored Snap: it just doesn’t feel like Snapchat. Influencers not only have highly engaged (if not more engaged) audiences than publishers and brands, they also fall into this “new media creator” category. Audiences online realize that they’re giving up so much for free they have to monetize it, and are willing to accept, trust and participate in the experiences and brands influencers partner with. It’s personal – Snaps are truly a 1-1 relationship, whereas most other social networks have put public discourse in the open, so any sponsored post on Facebook, Twitter or Instagram is open for public criticism. It relies on active consumption – Messages are only seen by keeping a finger onscreen, meaning someone has to make a conscious decision to open something that takes up their entire screen. It’s diverse – The most popular Snapchatters use video, photos, text and especially the drawing features to express multi-dimensional narratives. It spreads – Snapchat is an experience that stars on one platform, but quickly moves to Twitter, Vine and Instagram. Run a quick twitter or Instagram search on #snapchat and you’ll see thousands of screenshots of snaps being shared across multiple platforms. Look at a few of these top creators – almost seconds after they posts a big story, they’re jumping on Twitter or Instagram to respond to the discussions there, not just on Snapchat. It’s 1-to-1 and 1-to-many: Users on Snapchat can send messages to one another and also share public stories, and most influencers are regularly engaging back with millions of people sending snaps back to them. It’s intent-driven action: Snapchat’s stories don’t load in the background like Twitter or Facebook. Users actively have to consume the story by holding down their finger. Influenctial snappers build audience triggers like screenshot and replies, polling and more to create elaborate storyboards for the stories they tell. It’s community-based discovery: Snapchat still has no discover section. For new accounts to become popular, they need to be discovered and shared by other Snapchat influencers and users. You’ll see Snapchat work to make these stories seen more, whether they absorb some of the influencer content I’ve mentioned into Discover, or introduce some trending or tagging system a la Vine. I asked Kevin Jonas (Musician, Actor, Entrepreneur, and yes, of Jonas Brothers fame) to weigh in on this situation and how influencers like himself feel about this. Jonas has been working on his own Snapchat analytics tool, Flashopp, to help fill in that data gap for creators. I, too, will be curious to see the types of analytics being reported by Snapchat to the brands and publishers participating in Discover, and their reaction after the first few months of trials. The user’s experience cannot be underestimated. Smart brands already recognize that they can get on Snapchat, work with highly influential creators reaching millions of views on stories and build engagements that start on Snapchat and quickly spill over onto Twitter, Instagram, Tumblr and more. My answer? It’s definitely ONE way…but I don’t know if it’s ENOUGH to compensate for the self-discovery that sparks sharing today. The most important element of virality is making sure people feel like they’re discovering something before anyone else. When you serve up content like the morning newspaper, everyone’s discovering at the same time.